NPR’s All Things Considered did a feature on Downtown Project and Tony Hsieh, including our featured project, the Downtown Container Park. Always fun when a project gets some national attention. Check out the story on KNPR’s website. We’ve blogged about this already but the online link to the ERN Southwest article is finally available. Click the link below to read more about the award Breslin Builders received for the Downtown Container Park from ENR Southwest. On Friday, November 14, 2014, Breslin Builders’ Todd McBrayer and Steve Moore, attended the ENR Southwest Best Projects 2014 awards luncheon at the Renaissance Hotel in downtown Phoenix, Arizona. 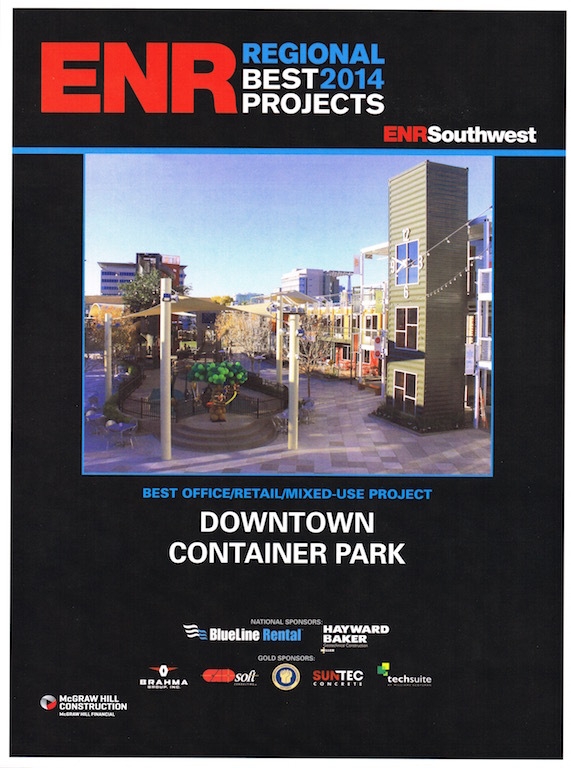 ENR Southwest has recognized the Downtown Container Park as their Best Projects 2014 in the Office/Retail/Mixed-Use category. Breslin Builders is honored and excited to add this award to others we have been part of the past, with one exception. This project is one were we provided both the design and the construction, delivering on the vision that Downtown Project and Tony Hsieh had for the corner of 7th and Fremont, and for the innovative use of shipping containers in a retail and mixed-use environment. It is not everyday that a company gets to do projects like the Downtown Container Park, a truly unique project in downtown Las Vegas, and one that we hope many other shipping container projects will use as their “research project” (just like Breslin Builders did with previous projects in the world). We are grateful for the efforts of our entire team of engineers, designers, subcontractors, and employees that made this project possible. Breslin Builders has recently been awarded the best new 2014 Office/Retail/Mixed-Use project for the ENR Southwest Best Projects for the Downtown Container Park project. The project will be featured in the November 2014 issue of ENR Southwest. Breslin Builders is excited to be honored for the work we did on this project, which is a true design-build project from start to finish, providing both design and construction services. More info can be found on this ENR Blog Post. Check out this link to IPME’s website for the Downtown Container Park. IPME was one of the many partners Breslin Builder’s worked with to bring this unique project to life. They were the masters behind the containers and the needed modifications. Fremont East Studios, part of the Downtown Project, has completed this cool video of the Downtown Container Park opening last November 2013.